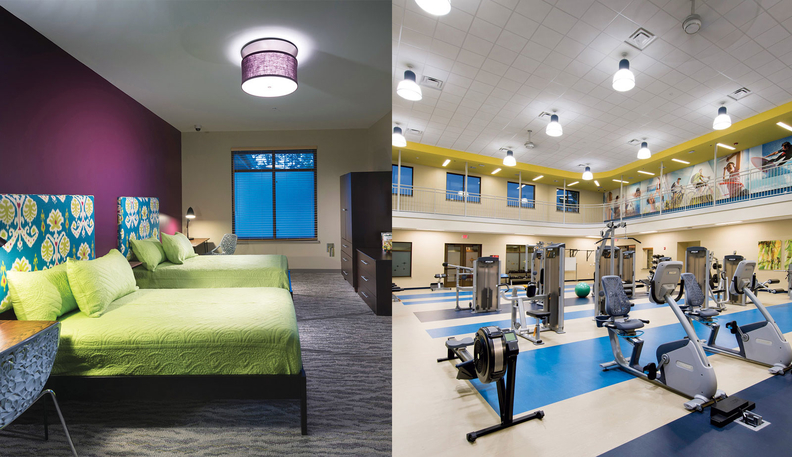 Lakeview Health, purchased by private equity firm Riverside Co., operates residential treatment facilities in Florida and Texas. In the midst of a nationwide epidemic of drug addiction, the U.S. has a big shortage of high-quality providers offering treatment to people with substance use disorders. So who's rushing in to fill the gap? Not many traditional health systems. It's private equity firms that see it as a way to build lucrative businesses they can sell for large profits a few years down the line, while providing an important public good. But critics say too often the companies they are building are not offering the most cost-effective services for the largest numbers of people. It's too easy to make money by repeatedly treating patients who relapse, without being held accountable for outcomes. In addition, many investor-owned providers have not entered contracts with private insurers and are not serving Medicaid patients, in both cases citing inadequate payment rates. That drives up insurance costs and leaves care out of reach for many people with substance use disorders. Through Nov. 20, there have been 26 private equity deals in 2018 involving addiction treatment providers totaling $320 million, according to PitchBook, a financial data firm. That compares with 21 deals totaling $66.5 million last year, and 12 deals totaling $189 million five years ago. Some of the biggest recent transactions have involved Pathways Health and Community Support, Fredericksburg, Va.; Addiction Campuses, Nashville; Ideal Option, Kennewick, Wash.; The Meadows of Wickenburg (Ariz.); and Delphi Behavioral Health Group, Fort Lauderdale, Fla. Acadia Healthcare, a large, publicly traded national chain of addiction treatment clinics, reportedly is on the market and is being courted by buyout giant KKR and others. Private equity firms are acquiring or building both residential and outpatient treatment centers. Only some offer medication-assisted treatment to help patients withdraw from drug or alcohol dependence, which is now considered standard evidence-based practice. Over the past few years, investors have seen lucrative opportunities in reorganizing the highly fragmented addiction treatment industry, consisting of thousands of mostly small clinics and solo providers and estimated to total $35 billion in annual revenue. That's because federal and state laws now require health insurers to cover behavioral and substance abuse treatment on parity with physical healthcare. In addition, the Affordable Care Act expanded Medicaid to millions of low-income adults and mandated that private insurers cover behavioral and addiction treatment as an essential benefit. And a new federal law expands the authority of state Medicaid programs to pay for inpatient treatment of substance use disorders in larger facilities. They see plenty of room for growth. Some 20 million Americans meet the criteria for substance use disorders. Of that total, an estimated 2 million have opioid use disorder. But a recent McKinsey & Co. analysis found the opioid addiction problem is significantly underdiagnosed and the nationwide prevalence may be 4 million to 6 million people. Only about 11% of people with substance use disorders are receiving treatment, according to the National Survey on Drug Use and Health. That means about 18 million people in need are not receiving care. But some investors are focused on developing high-end residential facilities for self-pay and commercially insured patients rather than comprehensive outpatient services for both publicly and privately insured patients. Their resort-like residential centers, often serving affluent patients who fly in from out of state, don't necessarily offer medication-assisted treatment or a full continuum of follow-up outpatient services. Relapse rates are high. That worries addiction treatment experts, who say providers should be building systems that offer a complete array of evidence-based services for people in their own communities and that are available to everyone who needs care. McLellan is working with Shatterproof, an addiction treatment advocacy group, to pilot a quality rating system for providers in three states, for use by consumers, payers, regulators and referring professionals. Another investing challenge for private equity firms is identifying high-quality, ethical providers that also have scale. Many providers have operated on a cash-pay basis and solicited patients through Internet ads and so-called body brokers who send them patients in return for referral fees. Desperate families of people struggling with substance use disorders often have trouble finding quality providers, because addiction treatment long has been walled off from traditional medical care and referrals often don't come from patients' primary-care physicians. In addition, recognized standards for cost-effective treatment have been lacking. Unethical advertising and referral practices have made it even harder. Two recent reforms may help winnow out bad operators. The federal Support Act enacted last month makes it a crime to solicit or receive any remuneration for referring a patient to a recovery home, clinical treatment facility or laboratory, whether the patient is privately or publicly insured. In addition, Google announced in April it will only accept ads from addiction treatment centers that have been vetted by Portland, Ore.-based LegitScript based on a criminal background check, licensure and a commitment to best practices. He cautioned, however, that addiction treatment is still at least five years away from becoming a more reputable industry, with reliable referral networks, standard treatment protocols and in-network reimbursement. Lakeview facilities remain mostly out of network for commercial payers and don't accept Medicaid. The Blue Cross and Blue Shield Association in September stressed the urgency of upgrading the quality of addiction treatment. By January 2020, it plans to launch a program identifying providers that offer state-of-the-art care, as well as a national hotline to connect patients with the best centers. The addiction treatment industry also has faced other types of scandals, putting private equity investors on the defensive. Some companies have faced criticism for questionable practices around urine testing for substance use disorders. Others have been hit with allegations of poor care that endangered patients. Last year, Massachusetts halted new admissions at the Recovery Centers of America residential treatment center in Danvers following the death of a patient and an exposé in the Boston Globe. The company, in which private equity firm Deerfield Management invested $231.5 million three years ago, reopened the Danvers center last May. She acknowledged that addiction treatment is a tough business serving a challenging patient population. But Recovery Centers of America, unlike some other investor-owned providers, is pursuing a strategy recommended by McLellan and other experts. It's moving to establish a broad array of inpatient and outpatient services in the communities where patients live and signing network contracts with insurers. “We see the for-profit, fly-away model as creating a very artificial disconnect in what should be a continuum of care,” Henshaw said. In addition, Deerfield is investing in tracking patient outcomes, with the goal of eventually entering value-based contracts with payers. That would be a breakthrough in a field where compliance with evidence-based practices is spotty and there is little or no provider accountability for outcomes. She also would like to see her company's centers partner with medical schools to train addiction treatment specialists. Greg Williams, executive vice president of Facing Addiction, a treatment advocacy group, said he would like to see private equity investors work more with mainstream health systems to strengthen addiction treatment services in each community and closely link the services with primary-care providers. Another private equity-backed provider that has developed a comprehensive, evidence-based model is Nashville-based CleanSlate, funded by Granite Growth Health Partners and HealthQuest Capital. It operates more than 50 outpatient treatment centers in eight states. CleanSlate centers are led by physicians and offer medication-assisted treatment including suboxone for opioid addiction and Vivitrol for alcohol dependence. They are almost entirely in-network with commercial payers, accept Medicaid, and partner with health systems, public agencies and other providers for a full range of services. Diane Daych, Granite Growth's managing partner and board chair of CleanSlate, said her firm sees it as the private sector's responsibility to increase access to quality addiction care and push the industry toward evidence-based practices. Williams' group, Facing Addiction, is working with health systems and insurers to encourage the development of comprehensive, evidence-based addiction treatment by mainstream healthcare providers, with bundled payments based on outcomes. Health systems, he argues, should reconsider their traditional aversion to this field because it's now a viable business, and they can't afford not to address a major population health problem. Still, even skeptics say private equity firms are playing an important role in expanding access to addiction treatment at a time when that's desperately needed.